We can’t resist anything that has chocolate and peanut butter. These peanut butter chex bars are no bake! You can have a delicious dessert in no time at all. Be sure and whip up a batch. 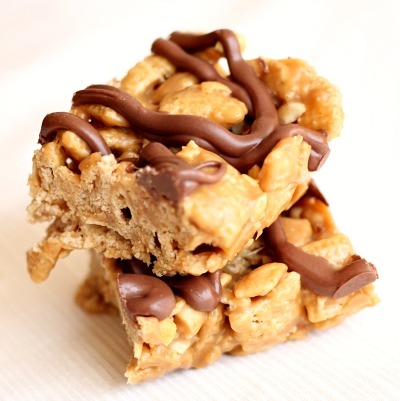 We love these peanut butter chex bars drizzled with chocolate. Grease a 9 x 13 inch pan. Mix the cereal and peanuts in a large bowl. In a medium saucepan stir together the brown sugar and corn syrup over medium heat. Bring the mixture to a boil for about 1 minute. Then remove from heat and stir in the peanut butter, vanilla, and salt. Stir until the mixture is smooth. Pour the peanut butter mixture over the cereal mixture. Toss carefully with a wooden spoon until all of the cereal is covered. Transfer the mixture into the prepared 9 x 13 inch pan and press down gently. Cool for about 20 minutes. Melt the chocolate chips in the microwave stirring every 20 seconds until completely melted and smooth. Drizzle over the cooled bars. Let the chocolate cool. Cut into bars and enjoy! Hi, I just made the peanut butter chex bars. It is Saturday and I am not serving them until Wednesday night. What is the best way to store them? You may want to freeze them in an airtight container if you are not serving them until 4 days after making. You can easily double this recipe. If they are slightly thinner because the pan is so large, that is still fine. They are so easy and delicious! Any suggestions for a substitute for the 1 cup of corn syrup? Or maybe a way to add less and substitute something else? Thanks! These are delicious! I didn't have milk chocolate so I used semi-sweet. They are gooey and delectable. Thank you! Do you think I could substitute Rice Krispies for the Chex? I'm sure Rice Krispies would work in this recipe too. Dry roasted peanuts or cocktail peanuts? Either will work, but we used cocktail peanuts.